Samsung Wind-Free™ air conditioner — Harbin Heating & Air Conditioning, Inc. The secret’s out. The Samsung Wind-Free heat pump cleverly features 21,000 micro holes in the unit’s front panel. While in Wind Free Cooling mode, they gently and calmly disperse cool air through a room. This gets rid of annoying drafts, so you don’t feel too cold, just really comfortable. It’s an advantage no other heat pump can match. The Wind-Free™ system provides users with the ideal condition by maintaining the desired room temperature using Wind-Free™ Cooling to gently disperse cold air through 21,000 micro air holes. First, the system lowers the room temperature in Fast Cooling Mode and then automatically switches to the Wind-Free™ Cooling Mode once the desired temperature is reached. The Wind-Free™ system has the added ability to connect to Samsung's Smart Home App. Controlling your comfort has never been easier. without any unpleasant direct airflow. So, no drafts. Enjoy a comfortable home with independent room temperature control. 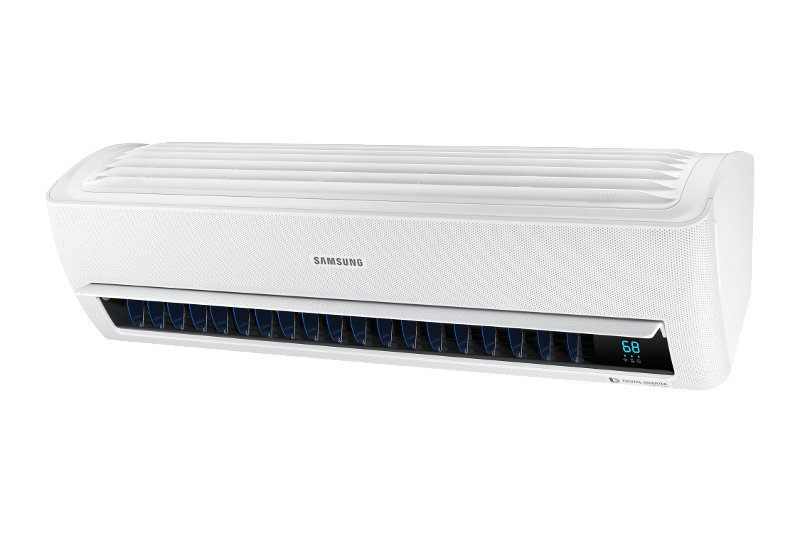 Samsung offers a variety of sleek, energy efficient systems to heat and cool your home. Operational costs are considerably lower for mini split systems in comparison to conventional systems. Each Samsung air conditioning system is powered by a variable speed Samsung inverter driven compressor. The variable speed control allows the compressor to operate at precisely the speed needed to generate the cooling and heating your home needs, resulting in increased effciency, reduced wear on the internal components and lower sound levels.